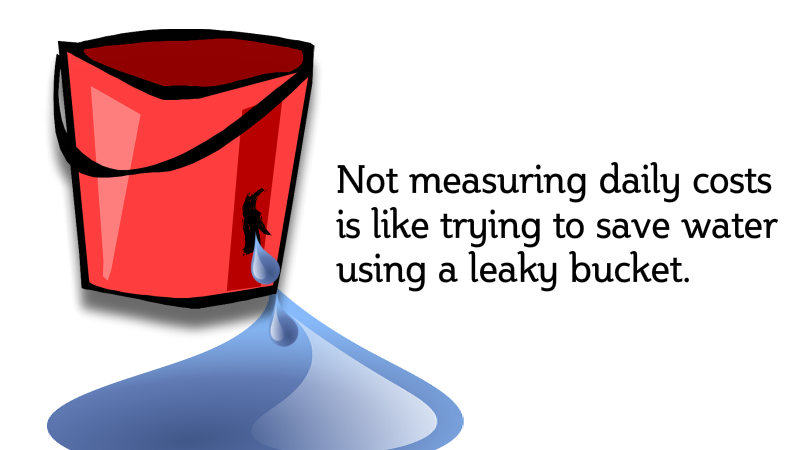 Why measuring business costs daily makes sense. Understanding the costs of running your business on a daily basis is essential. Some small businesses plan on a yearly basis by establishing an annual budget. The annual budget is usually broken down in to 12 months. The next step that many businesses overlook is establishing a daily operations system that records daily revenue, daily costs of sales and daily expenses. When you have a system that you update on a daily basis you can easily see some key metrics to help guide your decision making. You can see your daily costs of sales. You can see your daily expenses. You can see your daily profits. If you set up your system to show you a running balance of monthly profits, monthly costs of sales and monthly expenses along with their percentages against revenue it is easy to see if you need to modify your spending in relation to purchases and also in relation to labour costs. There are other budgeting templates you can use to measure and control purchasing but a daily operations template where you can see exactly where you are day by day is essential for improving operating profits. To set up a daily operations system you can use a spreadsheet to record the necessary details. I’ve always used Microsoft Excel but you can use Google Sheets or Open Office is another good alternative. These spreadsheets can also be integrated with a business solution like Domo. In my daily operations system I break down the monthly budget into individual days. The basic structure is outlined in a tutorial here. In the first column you put the day. The second column has the date. The third column is to record daily revenue or sales. 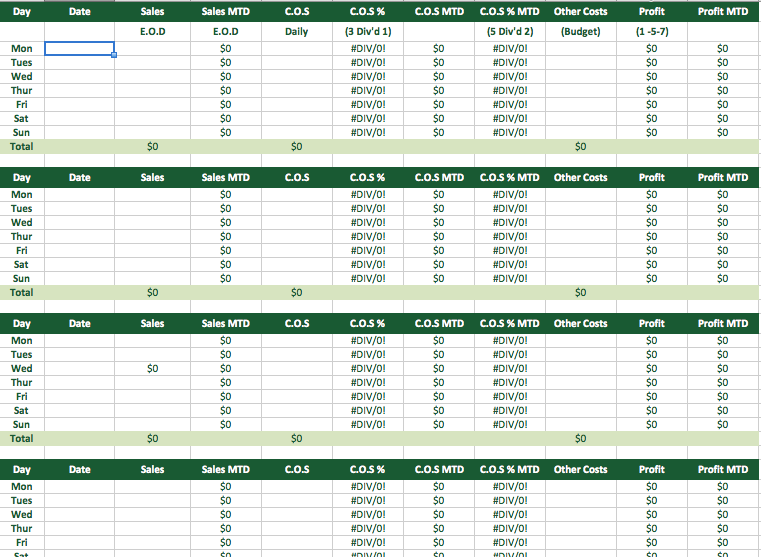 I’ve set up a formula to record the monthly total for revenue in the fourth column. In the fifth column I record daily costs of sales. The way to do this is take your estimated C.O.S. from your annual budget and divide the costs of sales for the month in question by the number of days in the month to get a daily estimated costs of sales. I enter that daily estimate for every day in the third column. The sixth column is set up as a percentage costs of sales relative to the daily revenue. When you display the costs of sales as both a figure and as a percentage it is easy to see immediately how you are performing on a daily basis in relation to your usual costs of sales percentage. The seventh column has the cost of sales total for the month to date. The eighth column I display the costs of sales asa percentage as a value monthly. This is a handy number to look at daily to see how your business is performing in relation to estimated costs of sales. Next I record my daily expenses or overheads as a daily figure. Take your monthly overheads total from your annual budget and divide it up by the number of days in the month. Enter an expenses amount in each day. The next column I show the daily profit. The last column has the monthly profit as a running total. Each of the columns is totalled at the bottom of the sheet as another way of viewing the data. 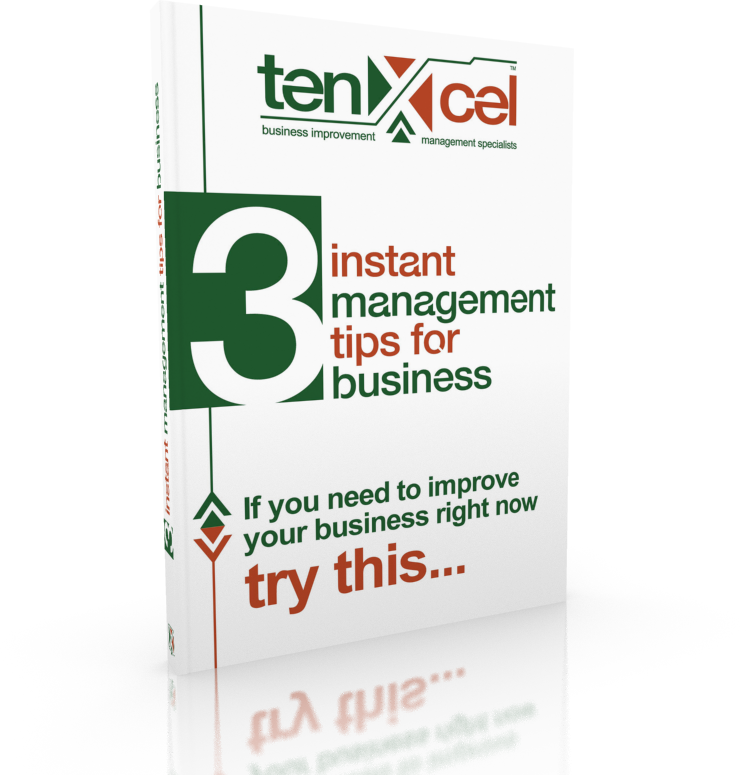 Inside the tenxcel business toolkit there is a pre-configured template that works for any kind of business. All a business owner needs to do is enter their figures from their annual budget and then record sales or revenue on a daily basis. The power of using a daily operations system is you can see at various points though out the month exactly where your business sits from multiple perspectives. You can see total revenue. You can see total costs of sales. You can see total daily and monthly profit. This template and system is an essential component of managing your business to improve profits and reduce costs. Use these tips to start improving your business immediately.